Physical therapy is in a very precarious position. Here in Colorado, our profession is fighting tooth and nail just to make insurance companies pay a fair price for the benefits their customers receive. Under many of these insurance carriers, physical therapy is paid per diem; meaning each visit from each patient is reimbursed the same. exact. amount. Essentially, our billing codes mean little as far as being paid, but still play a very important role in unlikely malpractice suits. Right now, patients might pay upwards of $60, $70, $100 as a co-pay! If you look at the reimbursement rates from insurance, they may only give the physical therapist $50. This means the patient is essentially paying for their entire plan of care on their own. How is this still happening for a tried and true conservative medical profession? We see the issues with manipulations, dry needling, direct access, and fair reimbursement for physical therapists all over the country. For such a widespread and effective form of care, physical therapy is sure facing a ton of obstacles. While we are aggressive in confronting these issues on a state-level, I believe the current landscape of U.S. healthcare demands a strong national movement. By beginning an aggressive campaign nationally through the APTA, we can positively impact the idea of healthcare to favor physical therapy. In many ways, the APTA has provided a lot of singular value for the individual physical therapist. However, as the national body for such a large healthcare presence, I think the APTA can do much with their powerful position. This is why I believe our governing body has not done enough to advance the profession in the eyes of Americans. How can we get fair co-pays for our patients if insurance companies still believe physical therapy is largely unnecessary? This was the main argument I heard from the opposition to our bill in Colorado asking for a fair share of payment between insurance and their consumers. Representatives of major insurance carrier, as well as those testifying for the Denver Chamber of Commerce, argued that this bill would encourage patients to go to physical therapists when they should be going to a “real doctor” for proper care? Yes, many patients need care that physical therapists cannot provide, nor should we. But the idea that insurance companies still view physical therapy as a service rather than a profession speaks volumes. By thinking of physical therapy as a service, that implies that we have less professional education and development, and that many others can simply “do physical therapy.” It really is discouraging to me that this is still the belief of many large healthcare entities. What I propose is a strong dialogue between physical therapists nationwide and their appropriate state chapters of the APTA. These state chapters need to collaborate in a way that shows the federal APTA that we all need help with our image. Not that patients have a bad image of what we do, rather they have no image of physical therapy. We can certainly change that! When our patients see what we do as a necessary and vital aspect of healthcare, and an effective way to reduce their healthcare costs, then we can make large changes for our profession. Until then, why should we expect changes from people who don’t even know who we are? As I sit here writing, I’ve seen exactly 5 political ads in one commercial break. Five! Granted, Colorado is a huge swing state for the House, Senate, and Gubernatorial races, but still. And of course, all these commercials are filled with mudslinging and misinformation to sway voters one way or another. Almost everyone I’ve talked to about the upcoming elections seems so jaded about the entire political process, and many hold out little hope that anything beneficial will actually get done. Honestly, I can’t blame them. The past few years, Congress has been so polarized that they intentionally fight over every bill to the point that nothing gets done. Can we really expect things to change after this year’s elections? The best response is one that we hear all the time in PT school: it depends. With the House currently controlled by Republicans, and the Senate controlled by Democrats, many bills easily pass one chamber just to get shot down by the next. The Affordable Care Act is still a hotly debated topic in Congress, despite being passed as law AND approved by the Supreme Court. Still, House Republicans have voted numerous times to either repeal, change, or add more oversight to the ACA. Some have passed, but many more have failed in the Senate. Each legislator’s stance on the ACA has had a huge impact in their current campaigns for election/re-election. Republicans are gunning to retake the Senate this November. They would then have the majority in both chambers of Congress, making it much easier to pass laws through without as much bipartisan support. In all likelihood, Republicans are going to retake the Senate. With Republicans actively trying to change or tweak the ACA, we might see more limitations put in place, or laws that would reel in Medicaid expansion across the country. The issue of Medicaid expansion is one specific issue that Republicans and Democrats bitterly oppose each other. Democrats wish to expand Medicaid coverage to millions more people under the federal poverty line, allowing more access to healthcare for the underserved population. Meanwhile, Republicans are mostly opposing expansion, because that would mean the government would have to pay more in healthcare for these people, ultimately causing more national debt. Obviously, changes to Medicaid would have a big impact for physical therapy, particularly for those working in acute care and inpatient settings. With more people covered by Medicaid, there will be more patients admitted, requiring physical therapists to appropriately discharge these patients quickly, as the hospital receives a lump sum for that patient, regardless of their length of stay. This may lead to higher productivity requirements for inpatient PTs, and reimbursement for rehabilitation departments can be significantly impacted by lower productivity measures. Even if Congress sways to Republicans, will there be sweeping changes to healthcare right away? I don’t think so. For one, Democrats will still have some authority, as they would still be able to filibuster more controversial bills. 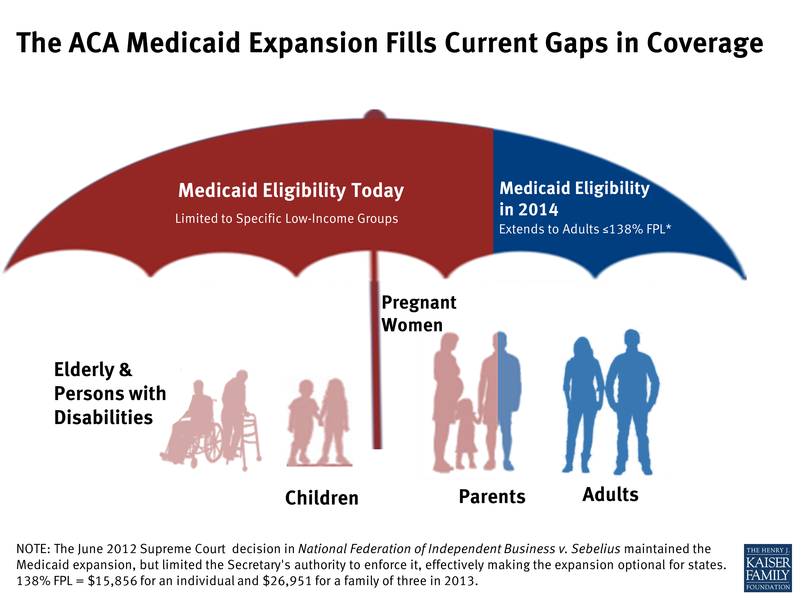 Second, Medicaid expansion has historically been performed on a state level. That means this would be dependent on gubernatorial elections, rather than Congressional. Perhaps the biggest barrier to large changes is the fact that Republicans are trying to gain more favor for their future presidential candidates in 2016. If they were to pass controversial healthcare changes next year, this could potentially lead moderate voters away from Republican candidates, particularly the more left-leaning voters. 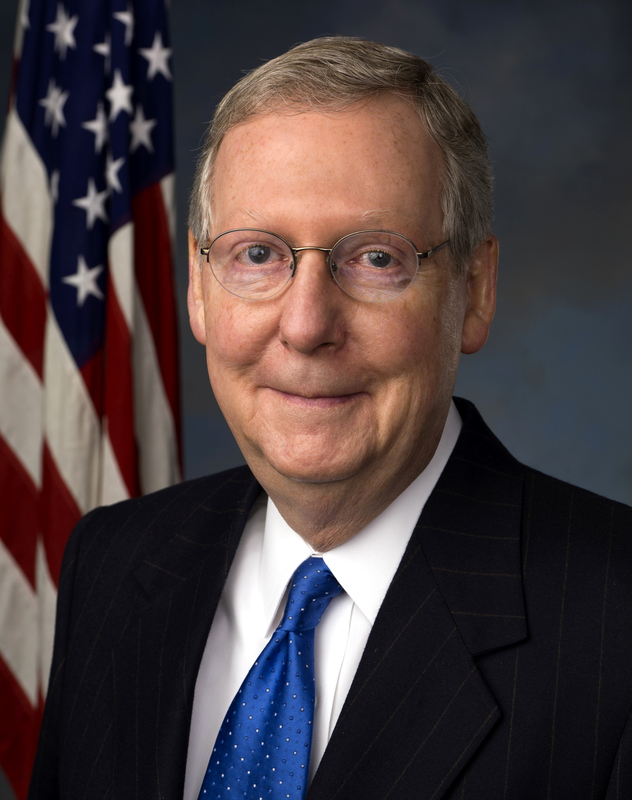 would become the Majority Leader. He has always taken a hard stance against President Obama and his attempts to pass more liberal legislation. If he does become Majority Leader, he would have the authority to determine what bills get considered in the Senate. With Congress already so polarized and gridlocked, this seems like the status quo for the next two years. This is actually a very interesting perspective, as the Senate Committees and sub-committees will also change hands. As you may remember from one of my prior posts, this is where many bills are either killed outright or passed on with amendments. If any healthcare changes were to occur, this would be a critical choke-point in order to pass. Ultimately, we’re not really sure what will happen next week. My belief is that with each party so entrenched and opposed to each other, it will be difficult to suddenly break that mindset with new leadership. We can always hope to see beneficial changes, but both parties must learn to work together for that to happen. Can we expect that to suddenly happen? Make sure to watch the elections November 4 to find out! Also, DON’T FORGET TO VOTE! It’s the biggest thing we as citizens can do to change the future and direction of our country. What do YOU think will happen after the midterm elections? Comment below, or find me on Twitter @tylerspt! I’ve wondered about medical research funding ever since I got into physical therapy school. It seems to be a huge portion of our federal budget (for good reason), and billions of dollars are given to government organizations such as the NIH every year. But, legislators seem to have significantly cut research funding in the past few years. Granted, the economic crisis of 2008-2009 was a huge blow across the board, but the government shutdown and following “sequestration” also had a huge impact on NIH grant awards. So why is medical research being put to the side, while our country’s population continues to grow older and chronic conditions are becoming more prevalent? If you’re reading this blog, you probably know that most political changes revolve around money. This can be good or bad, but ultimately depends on what our elected officials believe should receive more funding. 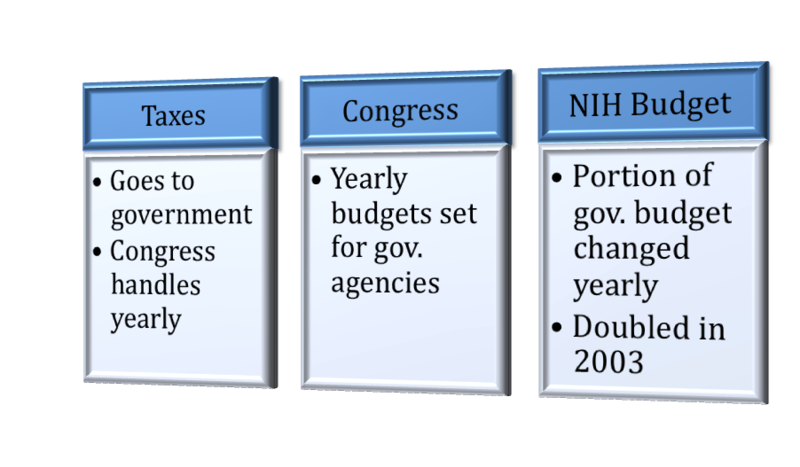 For example, in 1998, President Clinton made a priority of doubling the NIH budget, which occurred in 2003. Since then, medical research funding has become stagnant. This is ultimately causing our country’s best scientists and researchers to continuously fight for funding and grants, rather than actually doing research. The sheer complexity of research funding is well beyond the scope of my blog. However, we can get a good basic picture of the overall impact of funding and politics on medical research if we look at the NIH. First, let’s follow the money! Obviously, this is a rudimentary breakdown of how money is handled by the government. But what’s important here is the fact that the budget for the NIH, and consequently medical funding, can vary depending on the political climate. While there have been no huge changes in funding (expect for a $10 billion stimulus in 2009), the NIH can be a big target for reducing its budget, if legislators believe another government agency needs more funding. For example, in 2013 the NIH budget was $28.9 billion dollars. In 2014, the funding increased to $29.0 billion. The budget for 2015 has not been set yet, but a Senate bill would increase NIH funding to $30.5 billion, yet another increase. This bill, if passed, would also allot $100 million for the National Institute on Aging, effectively DOUBLING the research funding for Alzheimer’s. Great news, but don’t expect to hear anything else about this bill until after the upcoming November elections. So how does this impact physical therapy research? Well, an aging population means more chronic conditions, such as Alzheimer’s and Parkinson’s. Doubling the funding available for Alzheimer’s research essentially allows for a broader range of studies on effective treatments and rehabilitation protocols, something desperately needed for this population. The National Institute on Neurological Disorders and Stroke (NINDS), a part of the NIH, has also been leading research on Parkinson’s disease for years. In fact, NINDS led studies on deep-brain stimulation, which has shown to be effective for reducing tremor and improving quality of life. Of course, being a member of the NIH, the NINDS is affected by changes in the overall NIH budget. In turn, advancements in physical therapy interventions for these people can and will change with new technologies and evidence that different forms of treatment can be more effective than what we use now. While the research mentioned above is great, none of it would be possible if legislators are not aware of the need for further research. We have to remember that politicians get requests for funding from hundreds, even thousands, of groups and organizations throughout their terms. The organizations responsible for acquiring funding for further research are often single-disease groups, like the Alzheimer’s Association or National Parkinson Foundation. These two are examples of huge organizations that have enough political clout to be taken seriously (to be blunt) by legislators. Of course, any groups can receive research funding if they have a compelling need, but large organizations that have national support and donation funding are often the ones politicians turn to first. We as PTs can of course become members of these organizations, donate, and advocate for more research funding. If you are already involved with an organization, you can start advocating today! If not, becoming a member is as simple as becoming an APTA member (wink, wink). The APTA itself is also a strong political force in healthcare funding and medical research funding. The NIH funds many large physical therapy studies, so the APTA has a vested interest in the annual NIH budget. P.S. – I’d really like to thank all of you who read my blog! I’ve had a few people tell me they really like the information I write about, and that really means a lot to me. I know this information might be boring or bland, but hopefully my blog is making it easier to digest! Thank you all so much! Why don’t we talk about something a little more fun today? Yep, I’m talking about fun with Obamacare! The law itself is incredible dense and complex, so I’m only going over things that can directly relate to physical therapy. If you want to read more on healthcare reform, I suggest taking a long vacation and reading the entire document (but really, don’t do that). Originally discussed and passed by Congress in 2010, the Patient Protection and Affordable Care Act, or ACA, was under intense scrutiny and ultimately argued in front of the Supreme Court. In 2012, the Court ruled in favor of implementing most changes of the ACA. Since this ruling, many changes have already been implemented that current physical therapists have seen. But what are these changes, and what kind of changes are yet to come for physical therapy? Possibly the most widespread change brought about by healthcare reform is the individual mandate, which essentially requires all Americans to hold some form of health insurance. This was an important facet of President Obama’s reform to help stymie rising healthcare costs, as taxpayers would previously have had to pay for uninsured hospital coverage. Prior to the ACA, individuals could remain uninsured with no penalty. This was and continues to be a very controversial topic within Congress. So much so that its implementation has been delayed until 2016. Many believe healthcare is a fundamental right (in support of the ACA), while others believe healthcare is a privilege (opposed to the ACA). This portion of reform was passed with the notion that all Americans have a right to healthcare coverage, regardless of personal income or pre-existing conditions. For physical therapy, this has several implications. Ideally, the more people who have health insurance, the more patients we may see. While that’s all well and good, if more people seek physical therapy, insurance companies may reduce reimbursement in order to maintain profits. This is already in effect for many private insurers, as many of you may have seen. Many clinics are making up for decreased reimbursement by seeing more and more patients per day, straining physical therapists who are already pressured by insurance companies to document every detail and use arcane timed codes to get paid. made a sweeping definition of habilitative services, which are “Healthcare services that help a person keep, learn, or improve skills and functioning for daily living…these services may include physical and occupational therapy, speech-language pathology, and other services for people with disabilities in a variety of inpatient and/or outpatient settings.” These habilitative services fall under one of 10 categories of healthcare that insurance companies are required to provide. In this case, habilitative services fall under Essential Health Benefits. States have the individual option to define habilitative services, and the qualitative benefits associated with those services. Many states have adopted the NAIC’s definition above, or created a very similar definition. The important part is that some form of physical therapy services are now covered under the ACA. So what is the APTA’s take on the recent changes? This statement by the APTA President, Paul Rockar, gives an optimistic opinion of future changes in healthcare for physical therapy. APTA leadership is also taking the lead on several initiatives to increase recognition and reimbursement for physical therapy. Justin Moore spoke to my class recently, and stated that the physical therapist’s role in healthcare “has changed from a service to a profession.” If this distinction is made in the minds of our patients, the idea is that physical therapy will become an individual form of their healthcare, rather than the view that many providers can perform physical therapy. Right now, “physical therapy” isn’t even a protected term in most states, meaning other professions (i.e. chiropractic) can advertise that they provide physical therapy. The shift to a “profession” rather than a “service” can also lay the foundation for more freedom in practice and increased reimbursement under the ACA. With all the changes occurring in healthcare right now, it’s impossible to discuss all of them in one sitting. However, there are also changes we are not even aware of. Time will ultimately tell how these changes will impact providers, consumers, and physical therapists. In the meantime, I believe physical therapy is gaining significant traction, and is in position to become one of the best healthcare sectors in our country in the near future. The ACA is providing the platform for physical therapists to jump into the forefront of conservative and preventative care, which can reduce healthcare costs nationwide. Seeing as this is my last week of school ever, I have some extra time to write up another post. Ideally, I’d like to write up one post each week, hopefully two. If you have any interesting topics to discuss, let me know below in the comments or on twitter (@tylerspt). Anyway, before we discuss detailed issues in PT and health policies, I’d like to provide a quick o verview of just what the “legislative process” is. In my opinion, politics and making legislation are different ideas, but are both powerful in creating laws that govern all facets of American life. Politics tends to involve the actions necessary to get votes to pass legislation. This fits nicely into the democratic system of the legislative process. The process of a bill becoming a law can be quite long and tedious. Both the Senate and House of Representative must discuss and pass the bill. No matter which chamber introduces this bill, it must pass through both chambers. I made a nifty table below showing the differences in each chamber. Obviously my technological prowess is increasing. Chamber of Congress Representation Length of Term Current Party Rep.
Each Congress lasts for two years, and we are currently in our country’s 113th Congress. With upcoming midterm elections for both House and Senate seats, right now is the perfect time to read up on legislators and form your voting opinion. Personally, I like to use Politico for my election information, but there are tons of other websites dedicated to Congressional elections. Unfortunately, Congress has been gridlocked for several years, for several reasons I won’t get into. I mention political gridlock mainly because it has implications for lobbying efforts, discussed below, put forth by organizations like the APTA. Check out these stories on Congressional productivity at the Washington Post, NBC News, and Politico. Because there are an incredible number of issues our country faces daily, each chamber has committees and subcommittees that have legislators that are ideally more educated in that particular area. For example, say a Senator introduces a bill associated with healthcare. This bill is formally introduced in that chamber, then referred to the appropriate committee. In this case, it will likely be sent to the Committee on Health, Education, Labor, and Pensions (HELP). From there, the bill is often sent to a subcommittee that is more specialized than the larger committee. Let’s say our bill is asking for allocating more federal fund for Alzheimer’s research. This will likely be sent to the Senate Subcommittee on Primary Health and Aging. Members of the subcommittee then read the bill on its hearing date. Members are bipartisan, and have several options on what to do with the bill. Subcommittees can kill a bill in two ways: refusing to hold a hearing, or defeating the bill by a simple vote. Usually decisions are made after individuals have testified, or at least given the option. Members of the subcommittee can also add amendments to the bill, and can be re-submitted as a “clean bill” with these amendments added. After hearings are held, amendments added, and debates have ended, the subcommittee then votes and approves the bill to be sent back to the larger committee to repeat this process. The larger committee can also refuse to hold a hearing, or they can kill or approve the bill through a vote. Let’s say our bill is so great both the subcommittee and full committee pass it with no substantial amendments. From here, the Senate Majority Leader (D-Harry Reid) schedules the bill to be heard on the Senate floor. At the time of the hearing, Senators can debate, add amendments that may or may not be associated with the bill’s topic (see Riders) or invoke other procedural methods such as cloture or filibusters. Once everyone has had their say, the full Senate votes on the bill. Given, that the Senate passed our bill, the bill is then sent to the House of Representatives and this process is repeated entirely. If at any point in this process the bill is voted down, it is killed. Because of the lengthy process of a bill becoming a law, it is essential for individuals or organizations with a vested interest in the outcome of the bill to have an outlet to speak to legislators to vote their way. This outlet is commonly known as lobbying. **I’m going to be as objective as possible, but feel free to voice your opinion professionally if you feel inclined to do so! In its simplest sense, lobbying is how organizations persuade legislators to vote for the cause for which they are advocating. Large organizations that have either a national reach and/or a large political interest hire lobbyists to speak to legislators for them. For instance, the APTA is leading a strong lobbying effort to persuade legislators to repeal the Medicare Therapy Cap. Some of our membership dollars go to paying lobbyists to work with legislators in a way to persuade them to side with the APTA. These lobbyists are professionals, and may or may not be involved with the organization they are hired to lobby for. However, they are very well read on the current political climate, legislators they may be able to persuade, and any prior precedents for their bill to fall back on. Average citizens can also lobby for their own causes. Writing, emailing, and speaking to their legislators are small but effective methods of lobbying. Since many individuals have different interests they want to lobby for, this method is less reliable on getting a response from each legislator. However, if individuals were to gather together and collectively lobby for a specific issue, their voice would be much louder. Speaking of…. It’s that time of year for our second Flash Action Strategy! This is a student-led effort to simultaneously send our opinion of a topic of legislation to our representatives in Congress. This year, the focus is to persuade legislators to allow physical therapists to take an active role in youth concussion management. This Flash Action Strategy starts today (September 8) and will go through September 10, so please email your legislators from the APTA Website. It literally takes one minute! Hopefully this brief overview gave you some insight into how legislation works, why lobbying is so important in the legislative process, and how the APTA fits into all of this. Next time, I will focus the topic on the Affordable Care Act, and what physical therapists can expect in regards to practice and reimbursement changes in the very near future. Welcome to my blog, An Exercise In Politics! My name is Tyler, and I am currently in my third year of the DPT program at CU Denver in Colorado. I hope to make politics and the legislative process more interesting through my informative posts that (hopefully) generate some discussion. My interest in starting this blog came from a recently discovered curiosity in the political realm. Prior to beginning graduate work in physical therapy, I was never involved in student government; now I act as the Vice President of Legislative Affairs on my medical campus in Colorado. This position has opened doors to a new world that I was immediately drawn into. Ultimately though, this blog will reside in the world of physical therapy, as this is my first passion. For the past two years or so, I have focused my interest in politics to try to reach out to my classmates and other DPT students in Colorado, and encourage them to get involved in the legislative process as well. Admittedly, politics can be a very dry topic. That is why I made the primary focus of this blog to be relatable to DPT students and physical therapists alike. I want all readers of this blog to understand the nuances of politics on both a state and national level, and want to engage in enlightening discussions with all of you. As I mentioned above, I am new to the political scene as well, so I am still learning. However, if graduate school has taught me anything, I need to cite my sources! So, whenever I find information and/or statistics to use in a discussion, I’ll cite all the sites I used so everyone can read them on their own time. Many topics in the coming weeks will be focused on large subjects or areas of concern: ACA, the role of the APTA, direct access, Medicare, etc. However, once I work down to more minute topics on state levels, or brand new legislation, I will relay my sources to you. Finally, if you know me at all, you know I am a huge proponent of Twitter. I like to discuss all kinds of things, and hope to link this blog to my handle after every post. I am also taking the hashtag #AEIP (An Exercise In Politics) and using that in posts relating solely to this blog. If you would like to follow along, you can find me @tylerspt!